From now on, please keep all pictures and other media requests in this post. Keep this Silent Hill-related only please. I try looking for a pic of the lightsaber from Silent Hill 3. I have every I could think of and I either couldn't find one or the pic was not big or good enough. Now I just need some help with my search, the pic I need has to big enough to see some of the detail of the lightsaber. So if anyone can help me I would appreciate it. does anyone know where i can download this clips? er.. beside youtube.com? those youtube video cannot download, didn't see any save/download button to do so. please, can anyone help me? thanks!! Sorry about that, but anyway Watchdog asked me if I wanted a pic of the item itself or of Heather using. And I need a pic of the lightsaber itself. A close up shot of the lightsaber would be great. Don't be sorry Wayward, we just decided to create this thread. You did nothing wrong when you posted that thread. I need a pic of the lightsaber itself. A close up shot of the lightsaber would be great. 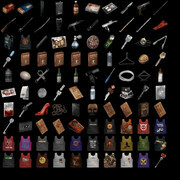 All i found was a list of all the items, couldn't get a close up, i'm sure someone will. Here i think its called Laura's Trick or something. Aw, and ty for the thankyou on the icons, but i can't take much credit, thisguy had it. But OMG! They'd make amazing icons! Thanks Figurine, I'm still going to look for a pic that bigger but it's a good start. I opened the items list with fax viewer, zoomed and print screened with paint to come up with this. I'm sure the graphics might have suffered. But thats really now all i've got. But yeah, a good start. EDIT: Guess what? Found a better quality one. Last edited by Figurine on 12 Jul 2006, edited 3 times in total. Figurine you are just too good to me. I would be lost without you. Last seen at: Over here. I co-own the Stanley/Heather fanlisting and I need more images for codes. Thank you in advance. Go here , there are pictures and notes, to make the pictures bigger, just save them, open with fax viewer, zoom in, print screen and copy paste in paint, similar to what i did with the light saber earlier. But please, if you're gonna do that, give them credit, link them to your site or something? thank you soooo much silenthell88 & Figurine!! Well here's something to start with. Hmm, those are very good. Thumbs up! Do you happen to have any pics of the Demon Children? Oh, BTW, here's a donation for your kindness. They're known as a mumbler more than being called demon children.